Common Questions » What is a T-Shirt Quilt? A t-shirt quilt is a quilt made from your t-shirt collection. Everyone has t-shirts that relate to their interests and activities in life. 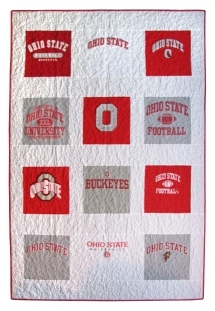 A t-shirt quilt is the perfect way to preserve your memories from the past or interests of today. 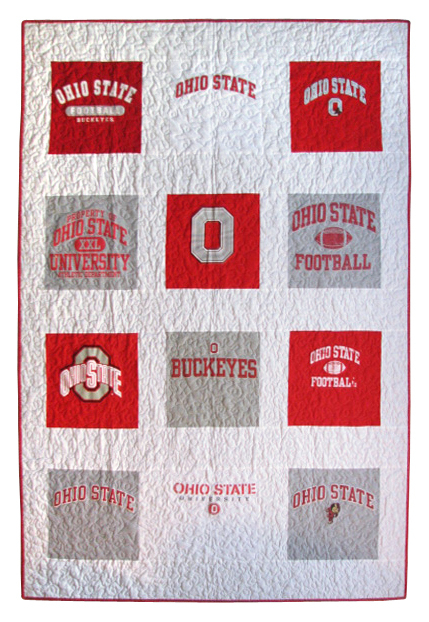 From High School activities to your favorite team or brand, Mary’s Quilted Memories can convert your old t-shirts into a useful and durable keepsake. What a great way to clean out your closet or drawers! Need a special gift for someone? A T-Shirt quilt makes a thoughtful and personal gift for nearly any occasion– Christmas, graduations, birthdays, anniversaries, and more. How much would they treasure a gift made from articles of clothing that reflect their interests? Lose a loved one? It can be a very difficult decision to discard clothing. Create an attractive keepsake for family members. These memorial quilts become a priceless remembrance. Take a look at our memorial quilts for other options. Runners, band members, athletes, a T-Shirt quilt will show off your accomplishments. Show your allegiance to your favorite team or brand. 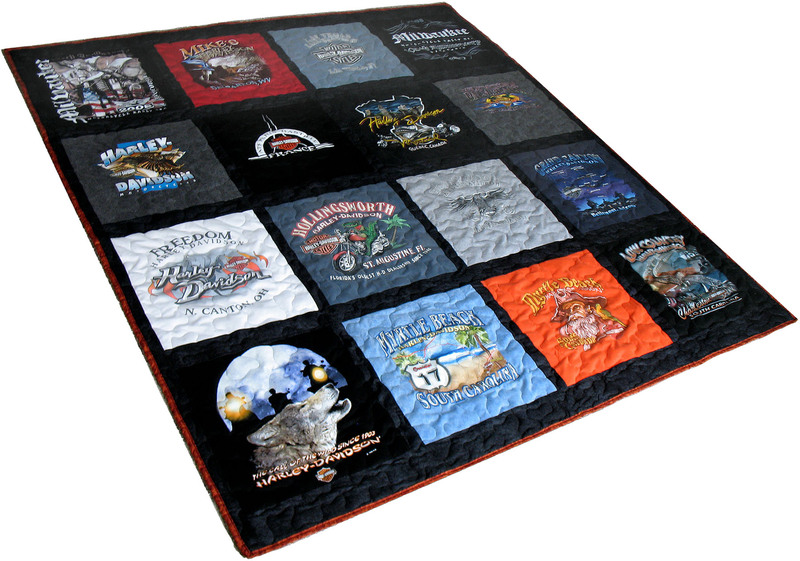 Harley Davidson Quilts are one of our most popular themes. It’s the perfect solution for those old rock concert shirts too! The options are endless. Let our website help you design, build, and order a t-shirt quilt, then let Mary turn it into a keepsake. Would you like to have a quilt made from your t shirts? 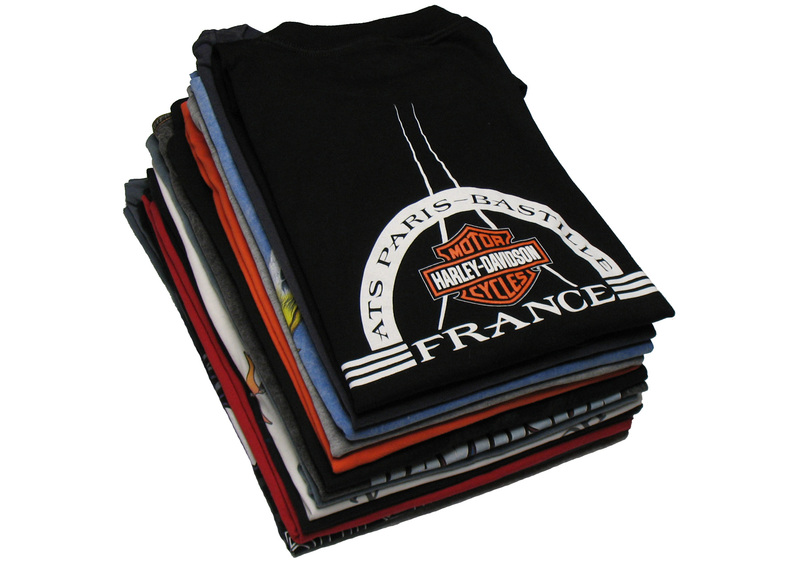 Get started creating your custom made t-shirt quilt now!